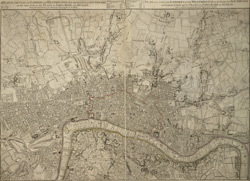 This map comprises two sheets with the title along the top in English and French, and a note comparing built-up areas of the four European capitals. City boundaries are outlined in colour. This is Robert Sayer's 1773 edition of the map first issued by Rocque in 1756.